Solace is a movie which initially makes the viewer think that it is about one theme before fitfully and eventually skillfully revealing another theme altogether. It's not quite bait and switch in my opinion because a lot of the clues were always there, if you bothered to look. I suppose you could be cliched and call this the thinking man's (woman's) thriller. It certainly fits that description, especially in the last third of the film. The problem was that the film wasn't quite as smart as it thought it was. It might have worked a little better to show things from the villain's pov. 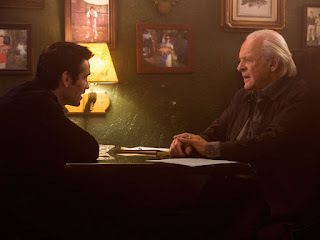 Although the lead in this movie is Anthony Hopkins, who does his usual masterful work, the other actors/actresses have such strong parts that you could fairly call this an ensemble cast. Depending on your belief system you may or may not believe that there is something in us that lives beyond our time on this planet. What is certain though is that each and every one of us is going to die sooner or later. Hopefully we will die peacefully after a long happy life. But there's no guarantee of that. Parents murder their offspring; good people die of cancer. Entire families are killed by a drunk driver; spree killers pick people at random to murder. Benign tumors suddenly become malignant; a brief lack of attention on the expressway can cause multiple fatalities. That's life. No one can know when and how his life will end. There's a lot of religion and music that suggests (literally) that one day we'll understand it all by and by (presumably when we've transitioned to the next stage just as a caterpillar transforms into a butterfly). Well maybe, maybe not. Job asked God why and was told to shut up and stop asking questions above his pay grade. The point is that on this world and in the time we have we don't have all the answers. We don't understand why evil (random and deliberate) seems to have such power in this world. I don't really know what to say about this story which recently took place in Forth Worth Texas. A white police officer insulted and arrested a black mother who was trying to make a complaint that a white man had assaulted her seven year old child. This story is a poignant example of white supremacy. This is really no different than what would have taken place in 1925. The only difference is that in 1925 no black person in Texas would have been under the slightest illusion that the police were obligated to respond to their calls for assistance and/or possibly arrest a white assailant. We've talked incessantly about retraining police or protesting or making police live in the areas they serve or hiring more black police or demilitarizing the police or having civilian review boards or so forth and so on. Those are all good ideas as far as they go but as we saw with the Michael Slager mistrial in South Carolina none of things mean a goddamn thing if the jury pool refuses to convict. And while convicting a truly guilty cop for abusing or killing a citizen is of course a good thing, it's infinitely better for the citizen not to be abused or killed by cops in the first place. As cops justifiably have no fear of sanctions for bad behavior from the justice system or their departments or their unions the only thing that will give bad police pause from committing wrongs upon citizens is if citizens start shooting them in the head. It is not normal for anyone to expect that American citizens should tolerate this sort of thing.This country was born in violent revolution from outrage over much lighter offenses.Other revolutions have started from anger over police brutality. The system has failed. If Black citizens can't even report crimes without being insulted, brutalized and arrested then that means that Black Americans aren't truly citizens. It also means that if you're going to be arrested anyway you might as well take the law into your own hands. So when someone does something wrong to you, don't call the police, handle it yourself. The mother trying to protect her son would have been wiser to call the men in her family to handle the assault upon her son instead of calling the police. The police are simply not worthy of trust or respect when it comes to Black people. It is inconceivable that that police officer would have been so contemptuous of or so quickly laid hands upon an upper middle class or wealthy white woman who was making a complaint. Racial hatred destroys society. I had heard wildly different things about this film, which is based on a DC comic book team of antiheroes. Some people claimed that it was overwrought, poorly written and incoherent. Other people claimed it was pretty good. Still others stated that it was sexist, racist, and any other "ist". After watching it I can safely say yes to all of those claims. It wasn't anywhere near as bad as some people said it was. On the other hand it isn't the "serious" work that The Dark Knight was. I was never a huge DC comics fan so I didn't go into this movie with any familiarity with the characters. If you were a DC fanboy sitting down to critique this film I can certainly understand how you might have looked askance at the page to screen translations. As I wasn't a DC fanboy all of that baggage went right over my head. I didn't have the massive expectations I would have had if I were a fan of the comic book. I'll have to check with my brother, who has an encyclopedic knowledge all all things comic related, to see what he thought of the adaptations. I was also interested in watching the movie because it was done by the same director who helmed End of Watch, Sabotage and Fury. The film reunited Will Smith and Margot Robbie who had pretty good chemistry in Focus. And it featured a bravura performance by Jared Leto which seems to have been severely and choppily edited. For what it's worth I liked this movie a little better than the last Captain America movie. 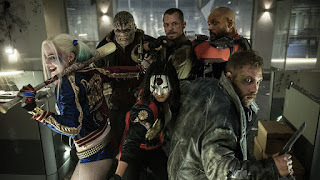 That may not be saying all that much but Suicide Squad is fun to watch, regardless of some of the logical and moral inconsistencies. 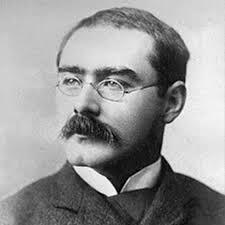 The British intellectual and Nobel Prize in Literature winner Rudyard Kipling for most of his life was an unabashed pro-imperialist and pro-colonialist who apparently never really gave serious thought to the idea that people, especially non-white people, shouldn't be ruled by their betters, by which he usually meant English whites or at least whites of Anglo-Saxon stock. Kipling had little confidence in the abilities of people outside of that group to rule themselves. He extended this skepticism to the Irish, being an ardent foe of Irish home rule. Kipling justified British rule over the Irish by using the same tropes and dodges that Europeans used to justify their rule over Asians and Africans. It was only later in life after his son was killed in WWI that Kipling may have begun to rethink some of his more jingoistic views.Even though Kipling was criticized in his time and ours for some of his more reactionary ideas, few people ever questioned his literary talent or his devotion to his country. The recent terrorist incidents in Germany, France, Belgium, the UK and elsewhere in Europe which were primarily committed by recently arrived non-Europeans reminded me of Kipling's poem "The Stranger". It's Kipling at his most nationalistic. I'm not a huge fan of this poem. It has a smug tone. All the same regardless of whether you think this piece is a stirring paean to nationalism or an ugly screed to race hatred I think it's important to realize that nationalism and its uglier cousins of xenophobia and racism aren't going away anytime soon. "The Stranger" touches something real in this world. Nationalism isn't automatically an evil thing. There are limits to how many immigrants any country can accept, particularly if the cultures of the immigrant and his destination country are very different. This is especially the case in Europe, where most of the countries have been ethnic homelands of one kind or another instead of open source states like the USA. Theoretically anyone on the planet can become an American. That has never been the case with most other countries. To be a German or an Ethiopian is a statement of bloodlines and ethnicity just as much as it is a statement of geographic origin. The unchecked influx of the Global South into the Global North can't go on forever. It has caused, and will continue to cause, an increase in the popularity of right-wing nationalist movements. And I don't think those trends will be good for anyone. We may imagine a world where everyone can all just get along but as long as we have different nations, different languages and different ideas about how to set up societies that world isn't going to come about by pretending to ignore our differences. Progressives will need to re-engage with nationalism. It can't be left to the right. People say that President-Elect Donald Trump will usher in a new era of fascism and lack of respect for rights. And perhaps he will. A man who has said that he will order torture of terrorism suspects, asks why we can't kill the family of terrorism suspects, refuses to admit that the Central Park Five were innocent and speaks approvingly of national stop-n-frisk, no doubt limited to majority Black areas, is not a man who has any great love for individual rights. I don't dispute that. My only issue with those who are suddenly discovering a fervent post-November 8th love for civil liberties is that right now, today, we are living in a country where there is less and less institutional and popular respect for or understanding of civil liberties. And this is happening under a Democratic Presidential administration headed by a former constitutional law professor. People worry about "normalizing" Trump. We have already normalized prison procedures for the entire dammed population that intends to travel by airplane. Like everyone else I have loved ones who I hope live to be as old as Methuselah. I don't want them harmed or killed by some religious nut who thinks God told him to blow up an airplane. But I also don't want them cavity searched by some bully with a badge who literally gets off on humiliating and searching people. I don't want people with "incorrect" political views harassed under color of law. As I wrote about a similar incident around airplane safety I definitely want some level of confidence that the people sitting next to me or mine on a plane have gone through the same boarding procedure as everyone else. But I would question if that procedure needs to include the touching of anyone's reproductive/excretory organs. There has to be a better way of doing this. But if I have to choose between liberty and safety I'm going to choose liberty. Firebrand CNN political commentator Angela Rye was subjected to a humiliating body search while trying to board a plane to New York City on Wednesday night. 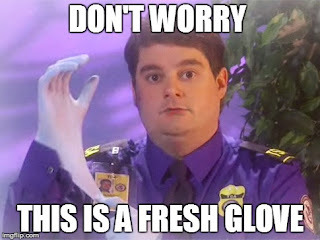 She posted the video to Twitter and alleged that the TSA employee who searched her twice touched her inappropriately. Rye said she was singled out for a random search and that she had not set off any metal detector alarms. The TSA called a police officer when Rye asked why she was being singled out. Officials told her she could cooperate or be escorted from the airport by police. Rye agreed, finally, to submit to the search, which covered every inch of her body, including an uncomfortable-to-watch probing of her genital area. By the end of the search, Rye was shedding humiliated tears. Godfather Two: Who Opened The Drapes? 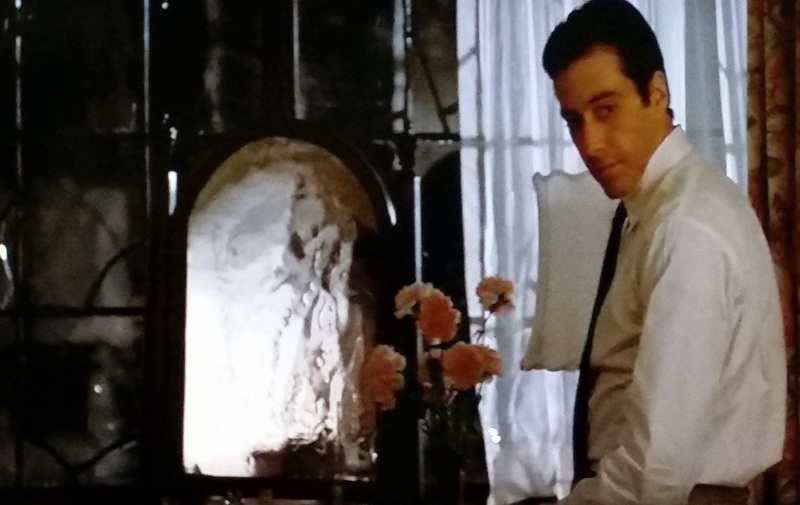 In the movie Godfather 2 after a long day of business Michael Corleone finally returns home to his wife and children. Michael's wife Kay has already gone to bed but was either not completely asleep yet or had awoken upon Michael's return. The lamp by the bed was still on. As Michael looks at a picture that his son drew for him his wife Kay looks at him with love but then curiously asks why are the drapes in the bedroom window open. Michael looks at his wife and then looks at the drapes. And he apparently sees the assassins just before they start shooting. He hits the floor and crawls over to throw himself on top of Kay until the shooting stops. Now the reason the drapes were open was to give the would be assassins a better shot at Michael. That's pretty obvious. What's not so obvious is who opened the drapes. Kay asks Michael why were the drapes open. This makes sense because, like most women, fictional or real, then and now, Kay was not an exhibitionist. She would undress in front of her husband but not in front of an open window. There's no chance that Kay would have undressed/changed clothes for bed unless she closed the drapes prior to doing so. So that means that when Kay went to bed the drapes were closed. Someone entered Michael's bedroom and opened the drapes.Who did this? Memphis Minnie (1897-1973) and her husband Kansas Joe were the original writers and performers of "When The Levee Breaks". As you might imagine it was about hard times after a flood that occurred near Greenville, Mississippi. Then as now, most of the people who lived closest to the flood plain were poor people. The song lyrics talk about what happens when the titular event occurs and how people have to find work and lodgings elsewhere. Musically it's a surprisingly upbeat song, considering the subject matter. 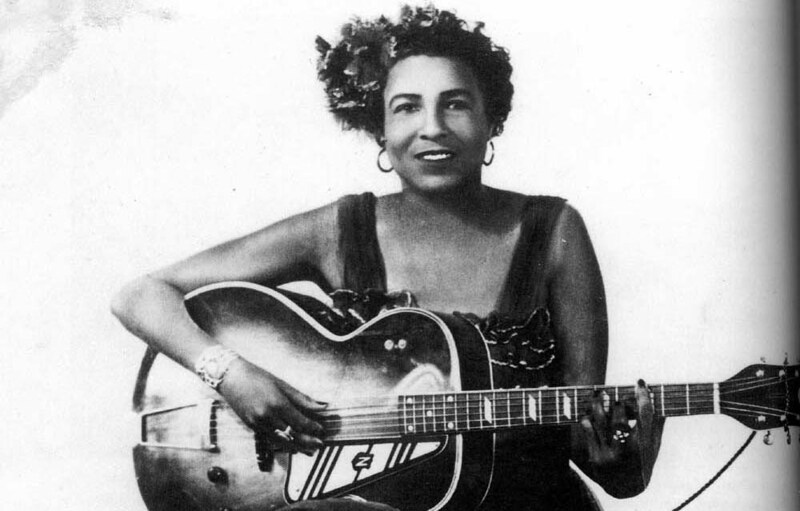 Memphis Minnie was one of the better known pre-WW2 blues guitarists. She was a huge influence, albeit often unacknowledged, on guitarists who came afterwards. Unfortunately by the time that rock-n-roll begin to take off her particular style of blues was considered decidedly old-fashioned. Also her age and health were starting to work against her by the 1950s. So it goes. Even so her biggest hit, the risque "Me and My Chauffeur Blues" was reworked by Chuck Berry into the raunchy rock-n-roll song "I Want To Be Your Driver". It amuses me how both versions of that song allude pretty directly to subject matter that any adult is familiar with while nonetheless avoiding dirty words. Some songwriters today might want to take a note or two. The titular song of this post was later covered by the British rock group Led Zeppelin. I'm not sure if the group originally gave Memphis Minnie credit but certainly modern releases have her name listed as a co-writer. Most people born after 1950 are certainly familiar with the Zeppelin version, as much for John Bonham's brutal bass drum attack if nothing else. That drum sound would later be sampled by Ice-T for his horror rap track "Midnight". It probably shows up in a few other rap songs as well. We hear a lot about former or current athletes who have lost all their money, abused their wives or girlfriends or otherwise behaved poorly in some way. It's important to remember that just as with any other job, the jerks, dummies and slobs are most likely a minority of the people that you'll meet. One person who is going above and beyond to help people in life is former Houston Texan wide receiver Andre Johnson. It is important to reach out and help those less fortunate than ourselves, especially if they're children. Children don't own responsibility for their situation. You may not have $20,000 to give away but I am sure there are other ways you can give of your time and resources to those who need and appreciate the help. 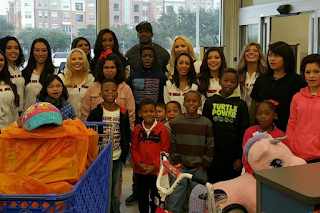 Retired NFL star Andre Johnson holds nearly every Houston Texans receiving record - but for the past nine years, Johnson has fulfilled a very different kind of streak. Come the holiday season, Johnson brings several children from struggling families into a Toys R Us - and tells them to pick out whatever they'd like. You'd think there would be a spending cap or limited amount of toys the children can take home, but Johnson has only one rule. Kids, ages 5-16, have to fill their shopping carts in 80 seconds (80 was Johnson's jersey number). Not hard to do when you're, you know, a kid in a toy store. Totals from Johnson's past shopping sprees have run between $5,000 and $16,000 - the kind of numbers that credit card companies send fraud alerts over (that actually happened to Johnson in 2014). But this year, Johnson set a new personal best. The total on the receipt? Exactly $19,144.58. Oh, and everyone got an Xbox (or their gaming system of choice). Naturally. Rubio was a clown. He never could have outfought Hillary. But what I didn't know until this day was that it was Trump all along. According to one model of human emotional process, there are five stages of grief which we pass through when a great loss occurs. These stages are denial, anger, bargaining, depression and acceptance. Most of the more intense Democratic partisans seem to be currently stuck in one of the first two stages. And they don't seem to want to leave those stages any time soon thank you very much. Some Democrats have progressed to the third stage. A tiny number of people are in the fourth stage. But virtually no one has reached the fifth. So it goes. Everyone who voted for Clinton or hoped that she would win will need to deal with Clinton's loss in their own way. In a country where a significant proportion of the conservative voting population dealt with the eight year reality of a black President by insisting contrary to all evidence that (a) he wasn't a citizen (b) wasn't black (c) wasn't Christian (d) was Muslim or (e) all of the above I'm not going to throw stones at anyone who needs more time to process the fact that Donald Trump indeed beat Hillary Clinton to become the 45th President of the United States. Those people should take all the time that they need to take. But for the people who are ready to deal with reality however unpleasant it might be, this examination of how Clinton lost Michigan will be useful, perhaps even required reading. Clinton suffered a close loss in Michigan. You could blame the Clinton loss on third party voters or Russian hacking or any number of other things. But ultimately the buck has to stop with the candidate. To summarize, Clinton made some very critical mistakes, some of which I and other people on this blog pointed out before the election. Others were just so basic that a campaign manager for high school class President would have corrected them. I don't think that this would qualify as police brutality. If the publicly available information is correct then the correct steps were taken. Of course just based on previous incidents where certain people have gotten out of pocket and have not had force used against them you always have to look at things like this with a very skeptical eye. Delta Flight 2083 was preparing to depart from Detroit to San Diego early Monday morning when the unidentified woman allegedly displayed aggressive behavior towards the attendants, according to NBC News. Passengers aboard the plane alleged that the woman walked past the gate agents in the terminal without showing a ticket or proper ID to board the plane, which initially prompted Delta personnel to approach her, officials confirm. Air officials were soon alerted to the incident. 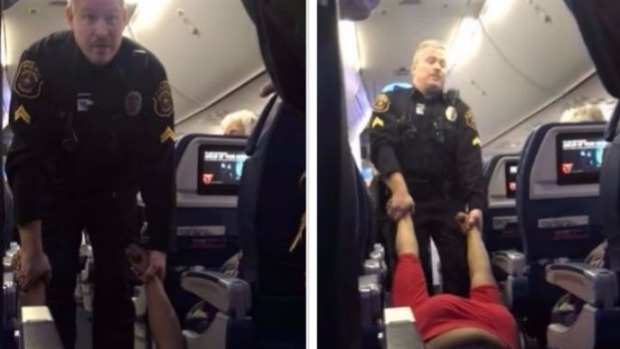 After the woman repeatedly ignored the officer's requests to leave the aircraft, security was reportedly forced to remove her themselves. 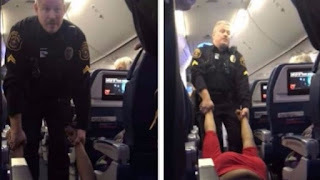 In video taken on a cell phone on the plane, two officers are seen attempting to pick up the woman, who was lying still in the middle of the aisle. It's unclear why the woman was on the floor to begin with, but voices heard on camera suggest she may have been tasered. After a couple of seconds of adjusting, they begin to move her down the aisle and off the aircraft before stopping midway. One officer then proceeded to drag the woman, whose eyes appear to be rolled back, the rest of the way. Given the post 9-11 extreme caution about who is allowed on planes and under what conditions, I am surprised that someone would think that he or she would be able to get on an airplane without going thru the same procedures as anyone else. I wonder if there is more to this story. But for now it looks as if the still unidentified woman was in the wrong. The rapper had arrived around 9 a.m. ET with an entourage in tow but without wife Kim Kardashian West. Half an hour later, West and Trump re-emerged in the lobby, where they posed for photos. But at the time, the rapper refused to answer questions about the purpose of his visit, saying, "I just want to take a picture right now." Trump later told the press that he had "discussed life" with West, whom he called a friend and a "good man." Kanye West is out of the hospital but not out of the woods, and it all stems from the rapper's erratic pattern of taking his meds ... sources connected with the family tell TMZ. Our sources say Kanye has long suffered from psychological issues controllable by medication. 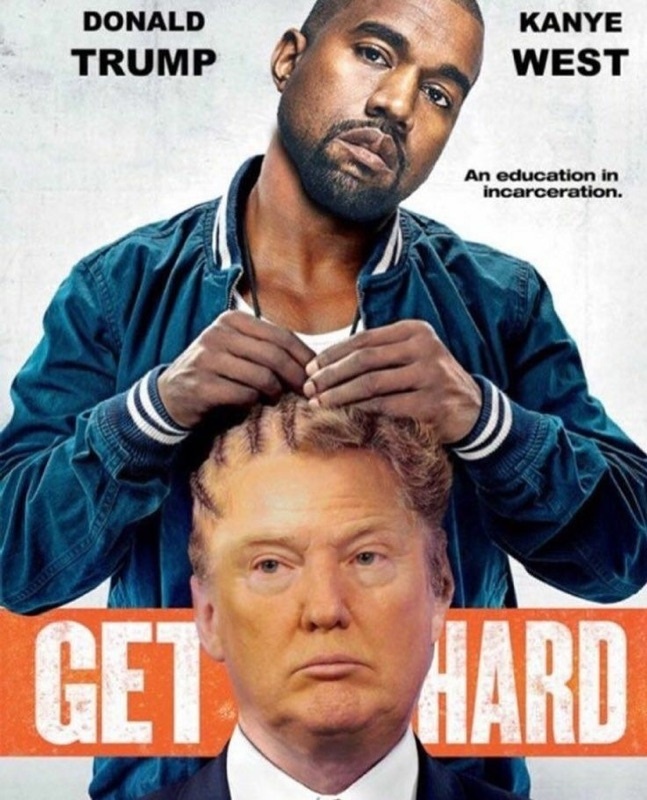 We're told Kanye is steady on his meds, but deviated from the prescribed dosage ... and that's what led to the downward spiral and eventual mental breakdown. It's still unclear if Kanye flat-out stopped taking some of the pills or just decided to take different amounts -- but we're told he made the biggest changes in the wake of Kim's Paris robbery. Doctors were able to keep Kanye in the hospital for 8 days, and during that time were able to medicate him, and get him more stable. We're told he's getting outpatient treatment and he's okay right now, but since he's not under 24/7 observation ... it's up to him to stay on the correct dosage. This added to the circus-like aspect of the meeting between 'Ye and the president-elect who, himself, has been the center of much controversy over the past two years during his campaign for office. 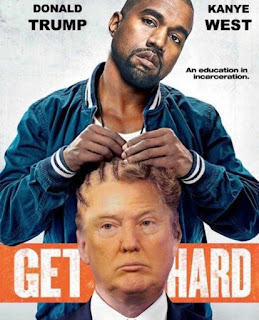 Apparently, 'Ye has decided to re-enter the political arena once again, an arena he has not entered since declaring famously that George Bush "doesn't care about Black people" after the President's lackluster response to Hurricane Karina victims in Louisiana. West has chosen to place himself in the spotlight after weeks of keeping an extremely low profile following onstage rants, a tour cancellation and hospitalization. During those rants, recorded by audience members, West declared before a booing crowd that he would have voted for Trump — had he voted at all. TMZ said West requested the meeting and there was no talk about his involvement in the new administration. I have no words. What about you? Just because he's blind don't mean he's a saint. This thriller movie is in many ways an updated version of the 1991 movie The People Under The Stairs. It veers from that movie's message of rebirth by playing with the audience's expectation of who to root for and who the bad guy may be. I couldn't tell you the whys and wherefores of every state or municipal law concerning use of deadly force by the homeowner during a home invasion or break in. I do know though that more states and municipalities have passed laws that give more latitude to homeowners to use deadly force against intruders without fear of criminal or civil liability-if the intruder was actually in the home. If someone breaks into your house why should you wait around to see what their intentions are? "Never mind the dog, beware the owner" is a sentiment shared by many homeowners, particularly those who live in high crime areas. And the city of Detroit is one of the nation's higher crime areas which is likely why this movie is set therein. This film only has four main characters, three of whom we first meet doing what they do best, breaking into homes and stealing goods. The crew leader is the blustering Money (Daniel Zovatto) a man who has obviously been listening to Eminem and Vanilla Ice too much. Money's girlfriend Rocky (Jane Levy) has a poor home life. Rocky's abusive mother is lazy. Rocky wants to take her little sister and split for California with Money. Alex (Dylan Minnette) is the brains of the trio. 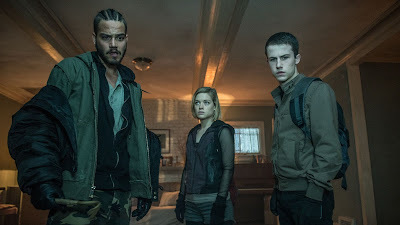 Alex's father works at a home security firm. So Alex has access to keys, electronic overrides and jamming systems, as well as intelligence about a home's contents. Alex has a healthy fear for the law. Alex attempts to minimize the team's chances of getting caught by only robbing empty homes. He knows exactly which crime is a misdemeanor or felony. A judge declared a mistrial Monday afternoon in the fatal shooting of an unarmed black man at the hands of a South Carolina former patrolman, after the jury said they could not come to a unanimous verdict. In a statement read by Circuit Judge Clifton Newman, the jury said "We as the jury regret to inform the court" that they were unable to come "to a unanimous decision in the case of the state versus Michael Slager" after a day of questions and deliberation. "The court therefore must declare a mistrial in this case and I so declare that is case is mistried," he said after the jury returned to the room and confirmed their decision. Scott's mother, Judy Scott, gave an emotional statement after the verdict, saying she "knows justice will be served." "God is my strength and I know without a doubt that he is a just God and injustice will not prevail," she said. Scott added that "we have the federal trial and another trail to go — I'm just waiting on the lord, I'm going to rest in the lord." "I don't care how it looks, it's not over — you all hear me — it's not over, until God says it's over," she said. Scott family attorney Chris Stewart said the mistrial was a "missed opportunity to heal a lot of wounds in the country" and "to remind the good officers that put on that badge that they aren't Michael Slager." "If you thought that we were going to come out here crying or weeping or weak, you don't know the Scott family. That was round one — we've got two more rounds to go," he said, adding that solicitor Scarlett Wilson planned to try the case again as soon as she could. The jury had remained undecided — but not deadlocked — on Monday in the murder trial. 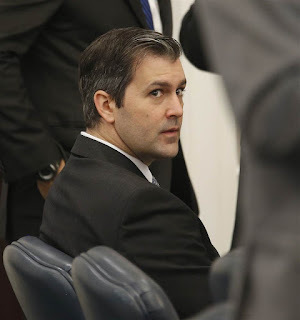 The defense in ex-patrolman Michael Slager's the five-week trial claimed that he feared for his life when 50-year-old Walter Scott got control of the officer's stun gun and pointed it at him. But Scott was shot five times in the back while running from Slager during a routine traffic stop. Slager was fired from the North Charleston police department after his confrontation with Scott on April 4, 2015 led to Scott's death. You may have heard about this recent interview/discussion/confrontation between conservative media personality Tomi Lahren and Daily Show host Trevor Noah. Using both logic and gentle ridicule where appropriate Noah shot down most of Lahren's talking points. 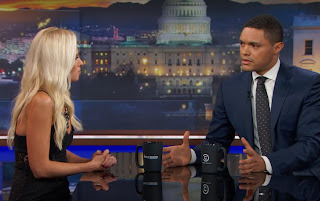 Although I think it's unlikely that Tomi Lahren will change her mind on anything anytime soon I think it's also important to engage and confront people who make bad arguments. One of the things which the right has done much more successfully than the left is to use telegenic seemingly friendly media spokeswomen and spokesmen to sell repulsive ideas. It's true that some of these people are indeed beyond redemption or aren't worth engaging because all they want to do is insult people. Debating your own humanity is a sucker's game. But sometimes people can be too quick to scream in outrage and cease debate when faced with ideas that challenge their mindset. This can be tempting; it's sometimes morally justified. There is no such thing as reasoned debate with a dedicated Nazi or someone who thinks slavery was a positive good. That person has made his decision. 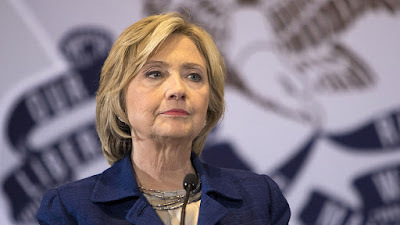 But to the extent that plenty of people on the right don't fall into those categories but still ascribe to "deplorable" ideas, as Hillary Clinton might put it, it is important for people on the other end of the political spectrum to engage in spirited debate and show people how and where they are wrong. Lies that go unchallenged can spread more quickly than one might think. People, no matter their political beliefs, should not be able to get away with making stupid comparisons based on facile analysis. The Jewish Defense League is not the same as the SS. A man using violence to free himself from slavery is not the same as a man using violence to keep other men in slavery. And the Black Lives Matter movement is not the same as the KKK. There ought to be better understanding about what the KKK wants, their past and their ideology. Black Lives Matter is a decentralized reformist movement that wants police officers to stop wrongfully harassing, beating or killing black citizens. The KKK is an organization whose very reason for being was to harass, beat or kill black citizens. So despite what Lahren thinks, these things aren't the same. Obviously both Noah and Lahren benefit from the buzz around this but I thought it was interesting comparing Noah's generally calm mien with that of Roland Martin, who when recently debating someone similar, let his hostility and emotion get in the way of the points he was trying to make. Watch the video below. This is a light hearted book about love, magic, and the possible end of existence as we know it. In this book magic is real, although most people don't realize it. There are three types of humans. The first group is the largest. These people don't believe in magic, don't understand it and if forced to deal with it will create for themselves a reality where magic doesn't exist. For these folks there is always a rational explanation for an odd event. If something magical happens in front of them their brain will create an alternate reason before wiping the event from their memory. The second group of people are slightly more magic-sensitive. They can believe in magic and under certain special circumstances can even use magic themselves. But like the first group they will generally forget supernatural events that occurred, though it might take a little longer for this to happen. They may go insane trying to remember magic. Some of these people spend their whole lives trying to grasp something they saw from the corner of their eye. But they never can quite see it. This is not a matter of hard work or training. It's something you either have or you don't. To paraphrase a snide book character, "You can't teach a monkey to drive a stick shift can you?" It's just genetics. The smallest group of humanity, and this group is indeed rare, is made up of those people who are not only aware of magic but are able to use it and interface with it without going insane or forgetting things that happened in order to save their own sanity. These people really do know what goes bump in the night and who the Boogeyman is. This group of people, despite their genetic ability to recognize or use magic, is otherwise like any other group of humans. They vary widely in their abilities, morals, motivation and intelligence. Monster is a man who falls into the third group. He runs his own pest control agency. This is a crypto-biological removal agency. 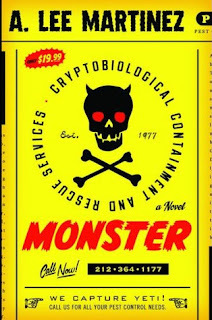 Monster captures and removes such "mythical" beasts as griffins, centaurs, kraken, ogres, trolls, wendigo etc. Monster has a college degree in this field. However business is not great because of competition, intrusive licensing and regulation, and arduous post-grad training. And getting bit or stung by magical creatures can have unpleasant side effects. "Lady, I don't recall asking you what you thought. How about I leave the delicate art of stacking canned goods in decorative pyramids to you, and you leave the yeti wrangling to me?" In ancient or medieval times (as well as in the 20th century) when a new king or queen took control, the previous ruler's closest relatives, friends, business associates or lovers would often make themselves scarce or even leave the country or kingdom. It could be hazardous to one's health to have a valid competing claim to the throne or to be seen as too friendly to the previous leader. If the new ruler was a paranoid, vindictive, vengeful sort who enjoyed nothing more than bullying people or eliminating perceived threats, he or she might kick off a set of purges. Sometimes the new ruler hated the old ruler so much he or she would forbid the populace from speaking the old ruler's name. If the new ruler was particularly egocentric, fame hungry and thorough he or she might order the elimination of the previous ruler's public works and the striking of the previous ruler's name and accomplishments from history books. Well we don't live in a society where the new President can go quite as far as the kings, queens, pharaohs and emperors of old. 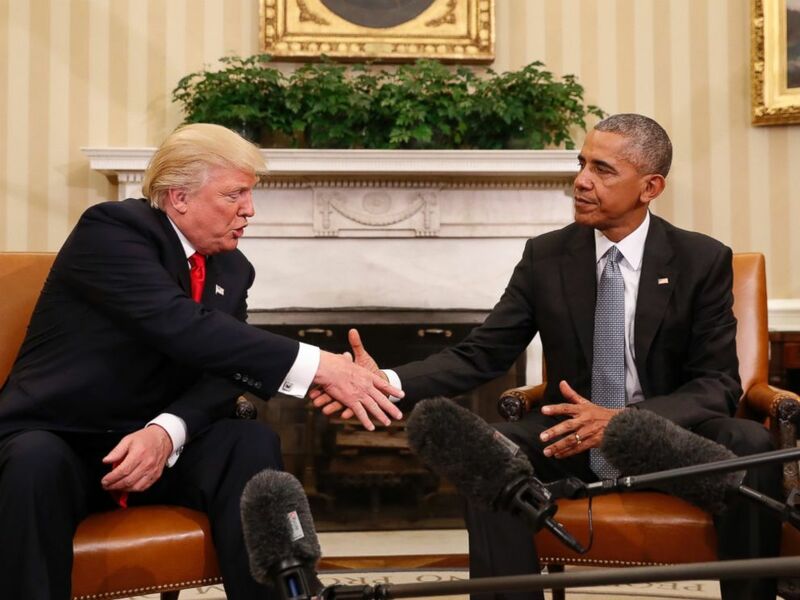 Barack Obama's name will live on despite the fact that he will turn over the Presidency to a man with whom he appears to share nothing but mutual disgust. But his accomplishments? That could be a different story. After Trump's inauguration the Republicans can kill ObamaCare, as they have threatened to do many times. President's Obama's executive actions or agency decisions on climate change, immigration and wage policy will all be under the gun. The Iran nuclear deal may be tossed or greatly modified. What is done with a pen and a phone may often be undone with a pen and a phone. Much of President's Obama's legislative or executive achievement could wind up like that puppy dropped off at a shelter by a bored callous family. There's a new sheriff in town, one with rather different priorities. But all may not be lost. A President Trump may well value policy continuity more than we realize. Some Obama initiatives are popular with anti-Obama voters as long as they don't know Obama was behind them. And Trump's cabinet looks as if it will have many of the same banker fat cats he excoriated Clinton for befriending. We'll have to wait to see what actions newly empowered Republicans take under President Trump. President Obama entered office with support from anti-war and pro-civil liberties voters but wound up continuing the wars in Iraq and Afghanistan while siding rather forcefully with the national security establishment on whistle blowing cases, domestic spying and surveillance. The Presidency gives you a different perspective on things, or at least it should. On the other hand the awesome power of the position can enable someone's worst instincts. I am still amazed that someone who throws temper tantrums on twitter will have nuclear launch codes but life is very strange. What do you think will be Obama's legacy? What will you miss (or not miss) about Obama? What worries you (or excites you) about Trump? Depending on what sort of dog you purchase or adopt you are looking at taking care of another living being for anywhere from six to sixteen years, give or take. The dog didn't make the decision to come live with you. You did. So why in the world would you break a commitment to an animal that if it's known for anything at all is known for its unbreakable loyalty? That stinks. But the world is full of callous people who can't be bothered to do proper research on what sort of pet they want or even if they are pet people in the first place. Fortunately in this instance it appears that the dog in this story wound up better off. Certainly that is no thanks to its previous family. People should think things through more carefully before they decide to have a pet live with them. Pets aren't toys to be casually discarded when you lose interest. 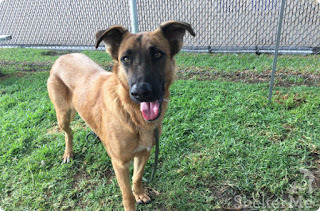 On Monday, Desi Lara, a shelter volunteer at the Los Angeles County Department of Animal Care and Control Downey, posted a video that will absolutely destroy you. It shows a 2-year-old German Shepherd named Zuzu, who was picked up by Animal Control after getting loose and hopping the fence into her neighbor's yard. When her family arrived at the shelter shortly after, Zuzu got super excited, thinking they had come to take her home. "With her fast wagging tail seeing her owners Zuzu lit up like a Christmas Tree," Lara wrote in the caption. "She looked like the happiest dog."